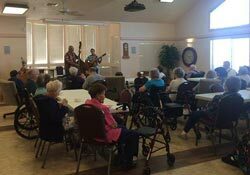 PeachTree Place Assisted Living Community in West Haven, Utah offers a rich array of musical activities to our residents. Music is food for the soul, and our residents eat well. We believe that music has a vast array of physical and psychological benefits that are often overlooked. Music lifts moods and improves overall well-being. It has also has been reported to have an especially positive effect on seniors diagnosed with illnesses such as depression, memory loss, dementia, and Alzheimer’s. 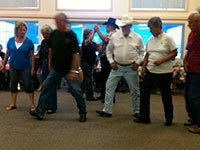 We invest heavily in providing a variety of musical options for seniors to take full advantage of. Seniors will benefit from the positive effects and enjoy a wide spectrum of musical talent. People with memory loss, who can’t remember family members’ names or have trouble just with simple conversation can, surprisingly, often remember all of the words to a song. Researchers believe that this may be due to the fact that music is the only activity that stimulates the entire brain. Music increases dopamine levels in the brain corresponding with a sense of positivity. There is nothing like hearing an old favorite song and feeling a smile instantly form to stimulate your brain and mood. Music is like an instant workout for the brain, reducing stress and stimulating neurons all in one (fun) fell swoop. 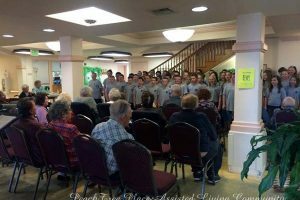 From concerts in the park to jazz at the station, we bring a wide assortment of options and events both at PeachTree Place Assisted Living Community and around the local area in Utah. We have something for everyone to get the brain moving with unique in-house musical guests and creative events. Whether on or off-site, there is something for every taste. 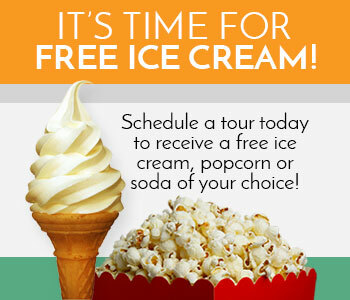 We offer something for everyone from exciting outings to local concerts and musical entertainment in-house. There are a number of great options for residents to enjoy and benefit from. Call or stop in today to discover how we can help or to find out more about the music related activities we offer and a schedule of upcoming events.